I have had this Scrabble tile pillow idea pinned on my pinterest boards forever – since before we even started thinking of buying a new house. My husband and I both enjoy playing Scrabble so I instantly fell in love with the idea and have been waiting for just the right time/place to use the idea. After weeks of furniture shopping, we finally just ordered a large custom sectional for the bonus room of our new house and I knew it would be the perfect spot to incorporate the pillows. I struggled choosing between the words “HOME” or “COZY”, but decided HOME worked best as the décor in our new forever home. The method I used to create my pillows requires you to cut a stencil out of contact paper. 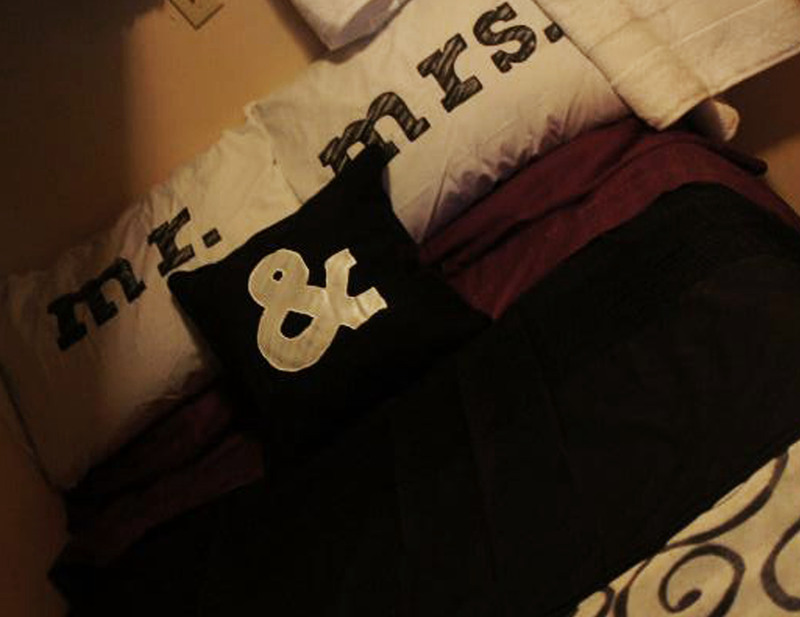 I had used this method previously to create pillowcases as part of my sister’s wedding gift (below), so I was fairly confident it would work for this project too. For the actual pillows, I found these 15×15″ pillows at Jysk. The cover came off easily, they were a good match to the Scrabble tile colors and at only $3 per pillow I didn’t have to worry too much in case the project was an epic fail. I am so happy to say it wasn’t and I am able to share this project with you. I began the project by laying out the letters and numbers in Adobe Illustrator using the font Arial Narrow Bold. For my 15×15″ pillows, I ended up doing the letter in 700pt type and the smaller numbers in 365pt. 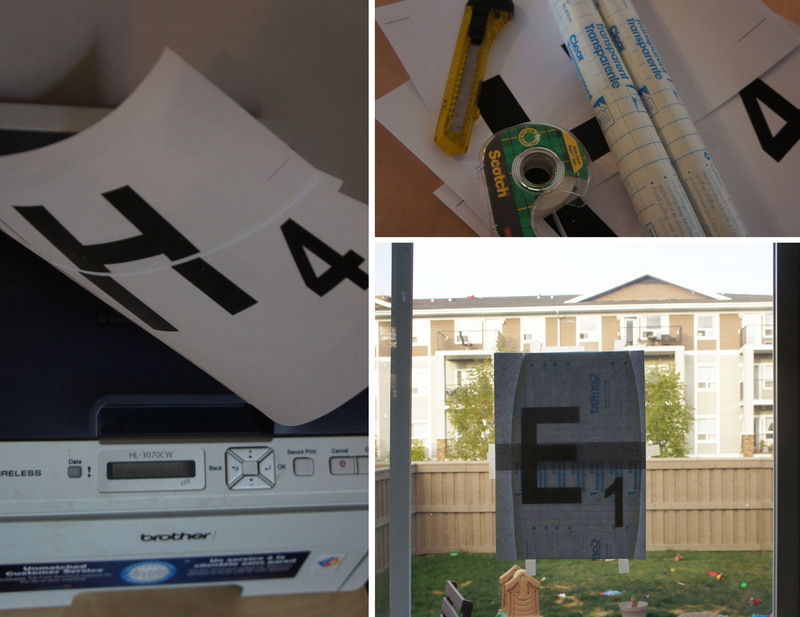 Once laid out, I printed the letters off on my home computer to use as my template to cut out my stencils from contact paper. If you are lucky enough to have a light table, that can be used to overlay the contact paper on the printed letters on cut them out. I improvised by taping my letters and contact paper up on my patio door so the sunlight acted as a light table. I then used my exacto knife and carefully cut out each letter/number. TIP: When placing the contact paper, ensure the side that you peel off is facing down or your letters will be backwards. 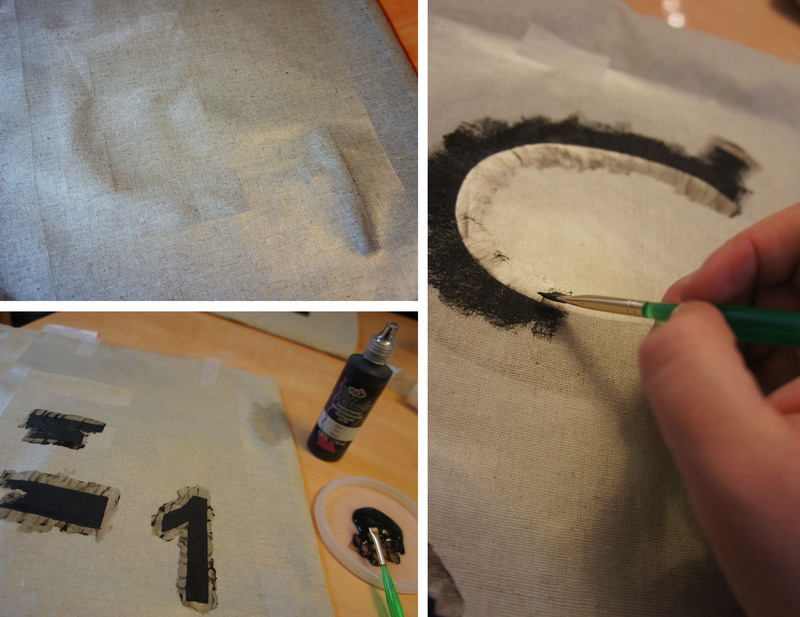 For letters/numbers with centers such as the O or 4, you will need to keep the middle sections as part of your stencil. From there, I placed the contact paper template on my pillowcases to determine exact alignment. 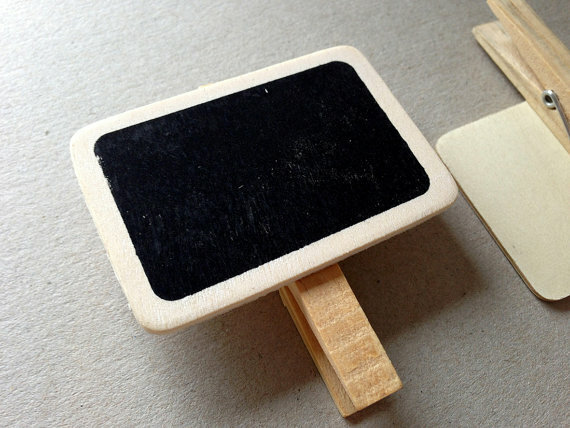 I begin by placing it with the backing still on and marking along the edges with scotch tape. The tape then gives me a guide once I peel off the backing paper and go to stick it down. It is a bit of a tricky process, but the contact paper is pretty easy to pull apart if it does stick on itself. Just don’t try to reposition too much once stuck down because it results in a less clean edge. Once stuck down, push along all edges to ensure there is a good bond and the paint won’t leak under the stencil. The final step is to begin painting. Place a piece of cardboard inside the pillow so the paint does not leak through to the other side and just begin filling in the open areas with the paintbrush and fabric paint. For clean edges, always start on the outside of the contact paper and brush in towards the open area. It is a bit tedious, but it makes for sharper edges. Once dry, just stuff the pillow back into the case and you are done! 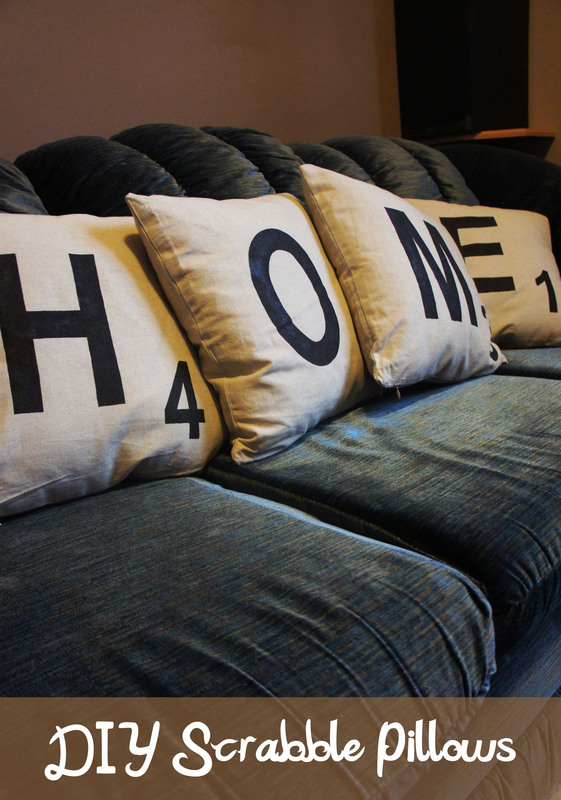 This method can be used for any type of image or lettering you want to put onto a pillow. Using the Scrabble tile idea, the possibilities are endless – you could do your child’s name or initial, or spell out “LOVE” or “NAP” for your own bed. It was a quick and easy project and I am very happy with the final results. Now to wait to get into our new house so I can see these on our pretty new sofa. Now that they are making good progress on our new house, my husband has suggesting it is time I start thinking about what I want to do with the kids new rooms. It doesn’t seem that long ago since I worked on my little girl’s nursery and I think I will just reuse most of the décor items in her room until she is ready to be moved up to a big girl bed. 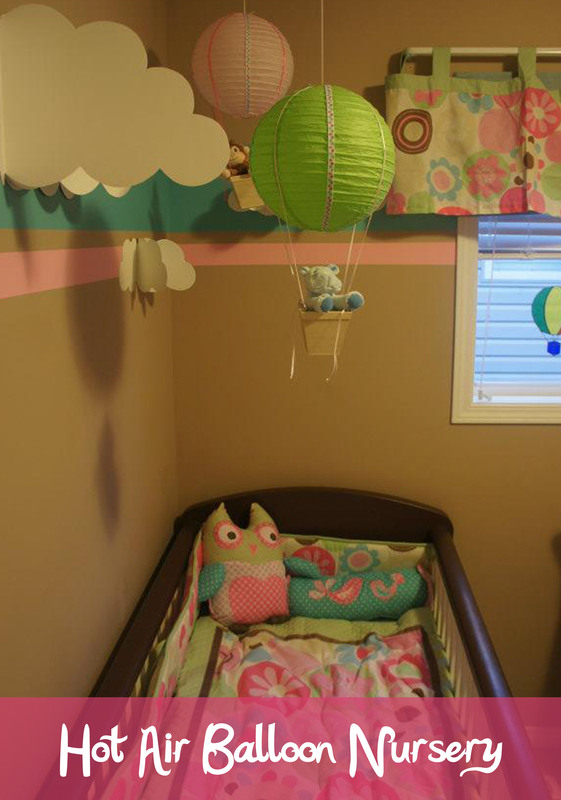 For her nursery, I chose a hot air balloon theme. I wanted something bright and girly and it seemed like an easy theme to pull off with a few simple DIY projects. 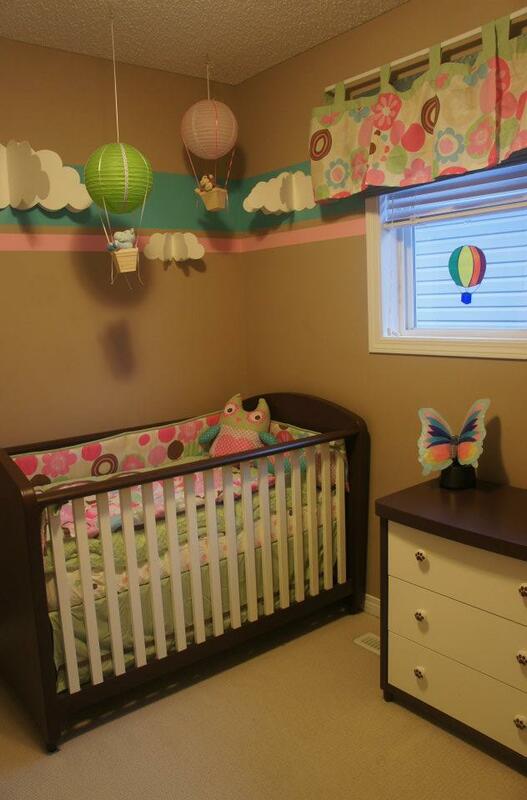 I started with a bright bedding set and we added stripes of blue and pink paint around the room. The blue stripe served as a sky-like background for simple 3D clouds I cut out of poster board and glues together using rubber cement. 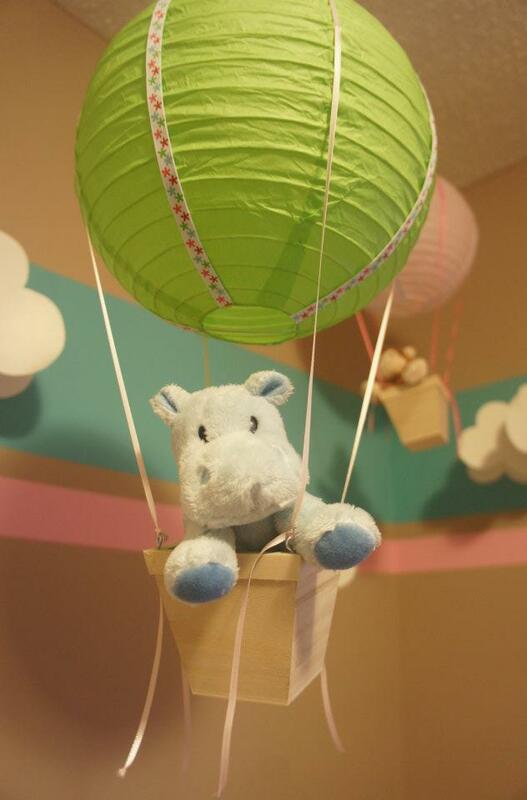 For the air balloons, I simply attached paper lanterns onto dollar store wooden baskets using ribbon and hot glue. 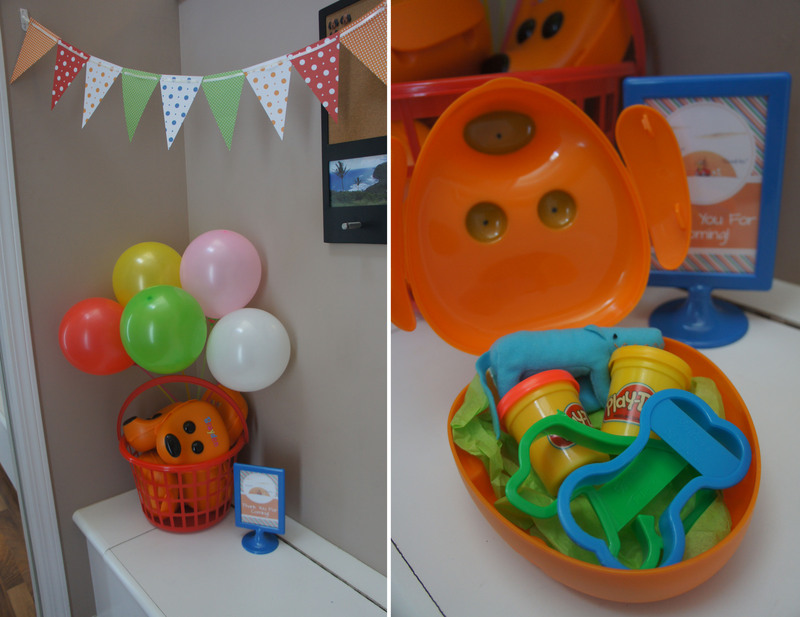 Each balloon was finished off with the addition of a cute animal in the basket and hung from the ceiling. 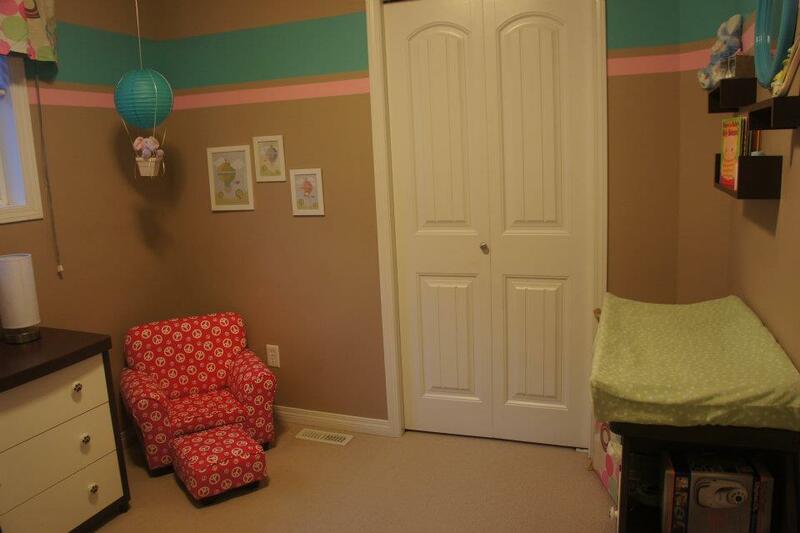 We ended up using the crib and furniture from my son’s nursery, but I did find her a special pink chair. 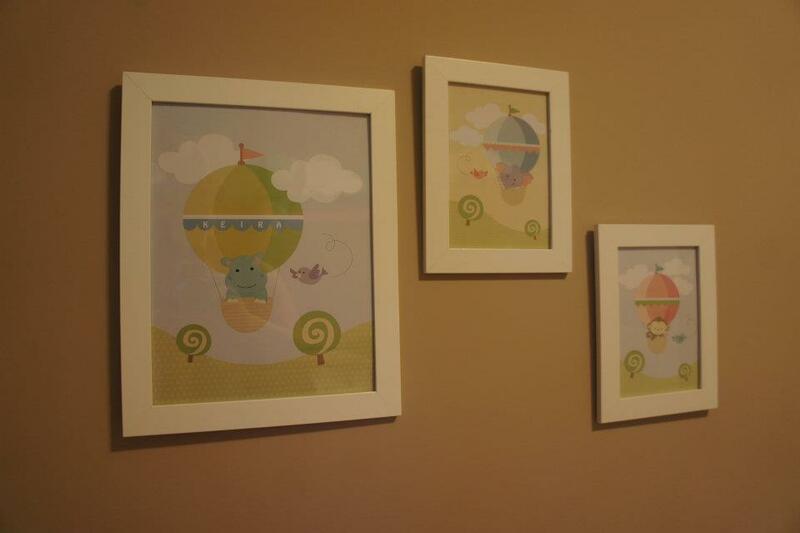 I carried the balloon theme through onto some wall art I hung by the chair in basic white Ikea frames. 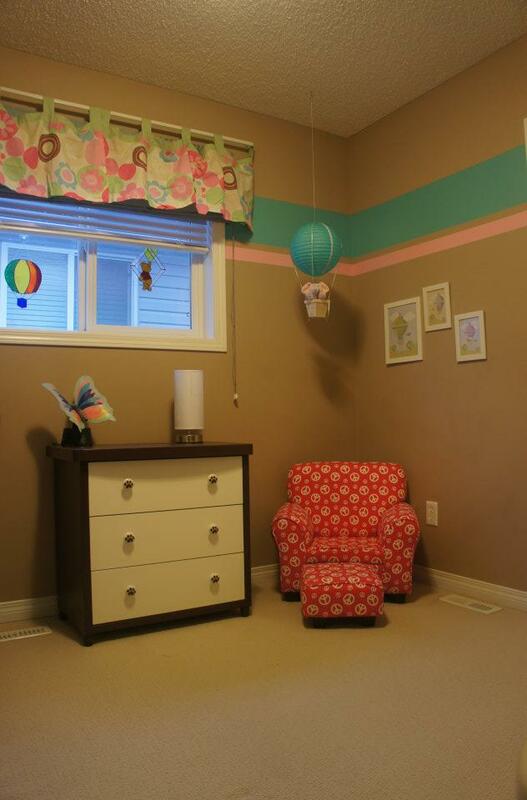 I am very happy with the finished space and will be a little sad to leave this house after spending so much time doing each of the kids nurseries. I love the pink, green and blue color scheme and I am pretty sure there will be a similar color palette once I do design her a new room. 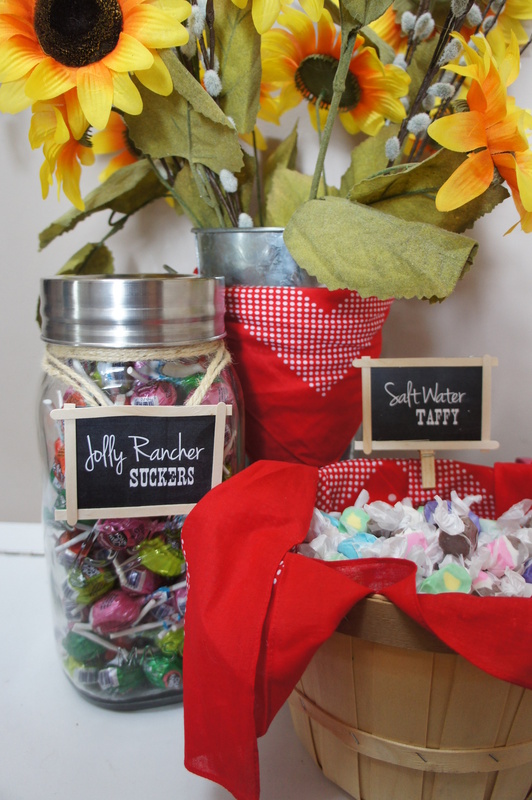 I came across these fantastic chalkboard tags on Etsy when looking for ideas for my country themed candy buffet. 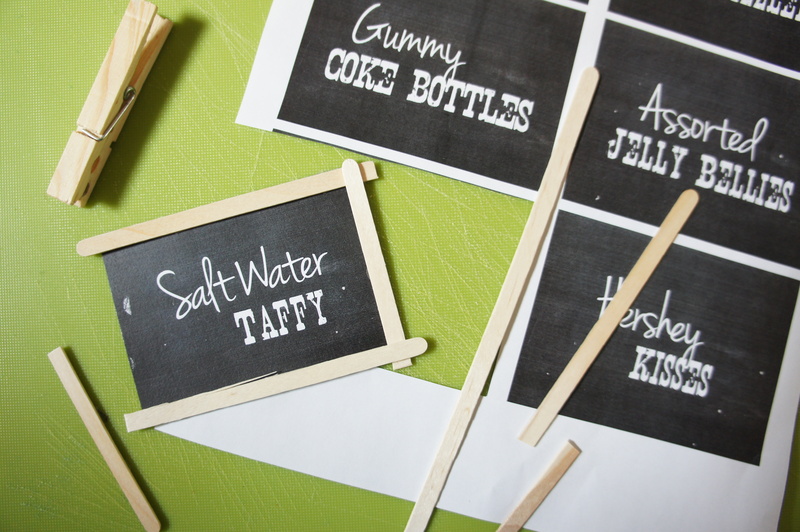 I love the chalkboard look, but was not really sold on the idea of messing around with actual sticks of chalk and handwriting each label so I decided to come up with my own solution. I already had a chalkboard background and several chalk-like fonts on my computer so I decided designing and printing something would be the easiest way to recreate the look. To make the wooden frame, I remembered that I still had a bag of coffee stirrers lying around the house from a previous project. 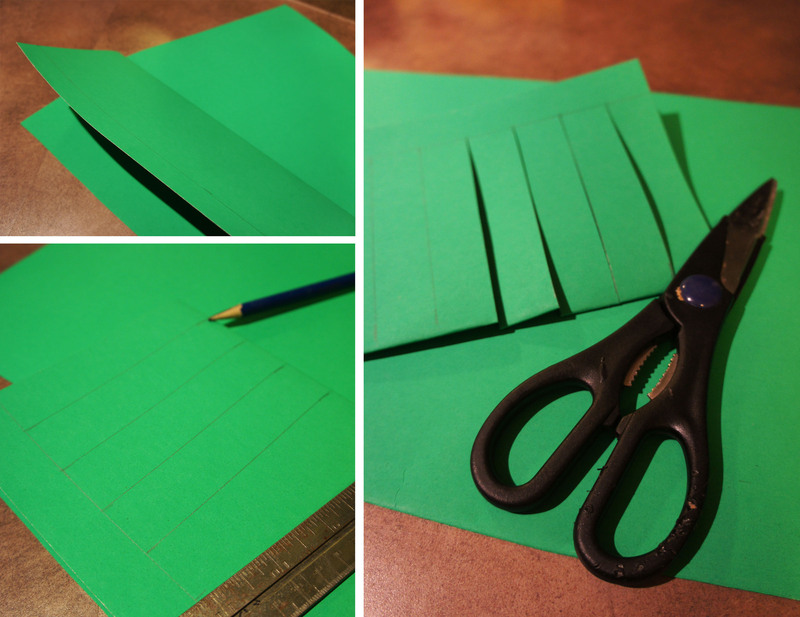 They were easy to cut to length with scissors and I simply attached them to the paper with double sided tape. 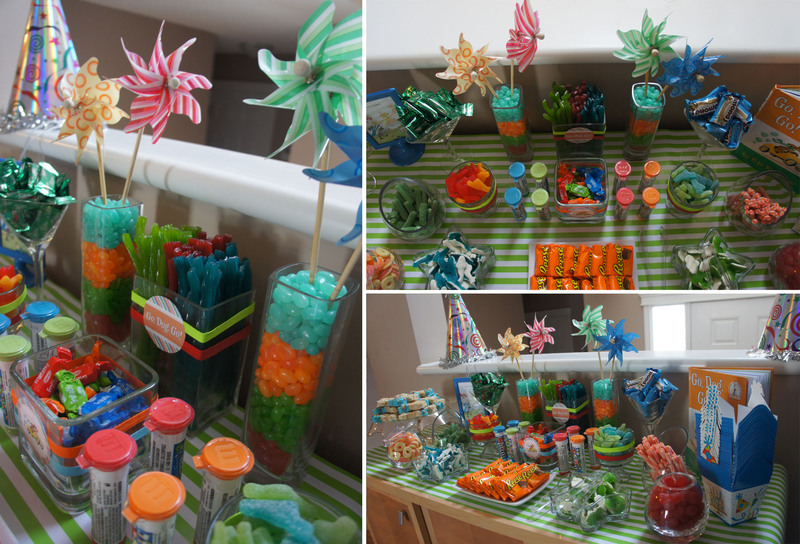 To finish the labels off for the candy buffet, they are either getting a clothespin glued to the back or they will be tied around the candy containers with string. I am very happy with the final result and love that the fonts give a more consistent look then I could have gotten by handwriting each one. All in all it was a pretty quick project and cost me very little. 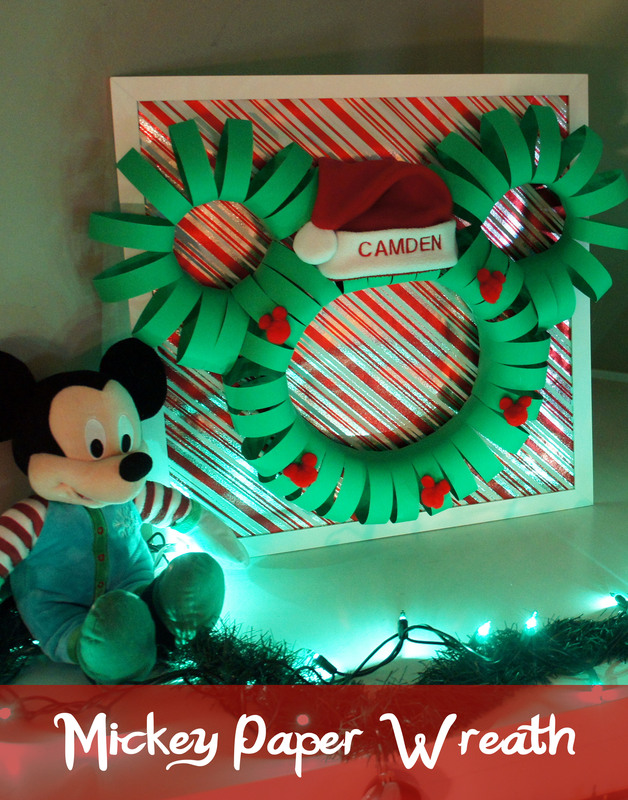 If you don’t already have them on hand, the basic supplies like cardstock, coffee stirrers, double sided tape, and clothespins can all be found at the dollar store. One of my favorite books growing up was Go, Dog. Go! by P.D. Eastman. I was excited when I introduced it to my 2 year old son and he seemed to enjoy it just as much, but after reading it nightly for several months my enthusiasm for the book began to fade. 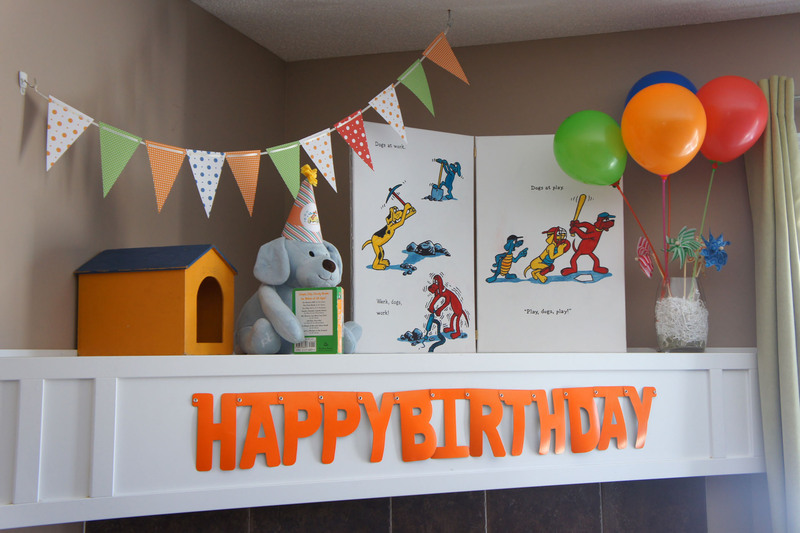 It did, however, make my choice for a third birthday theme quite obvious. I like to begin planning my parties at least a month in advance to give time to send out invites, order supplies and tackle all my DIY projects. 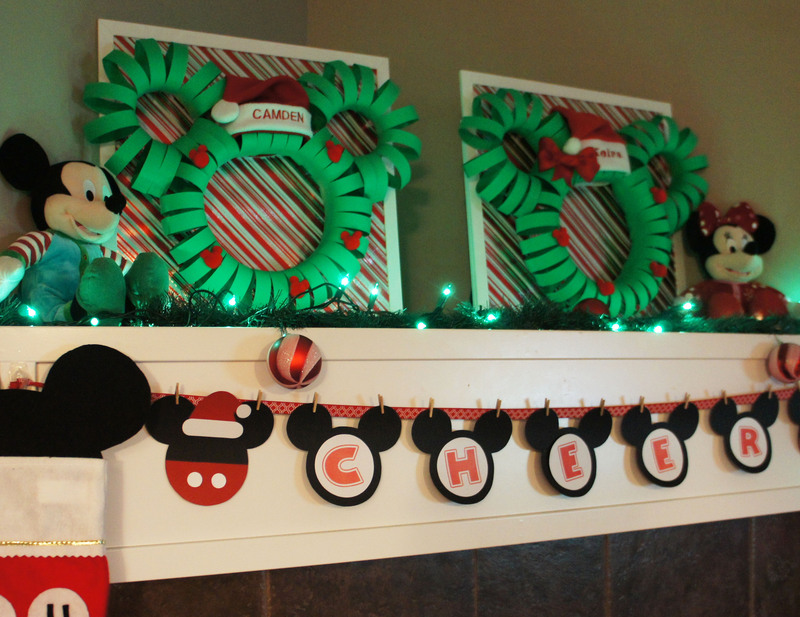 I begin by perusing pinterest and doing a google image search to see if there are any other party ideas I can “borrow”. There is not a lot out there for Go, Dog. Go! 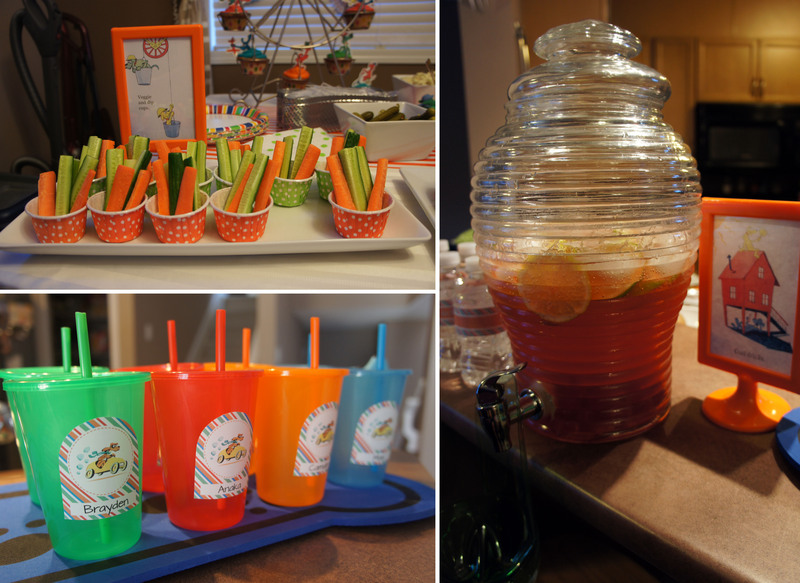 parties so it proved to be a bit of a challenge, but ended up being a lot of fun to plan and execute. 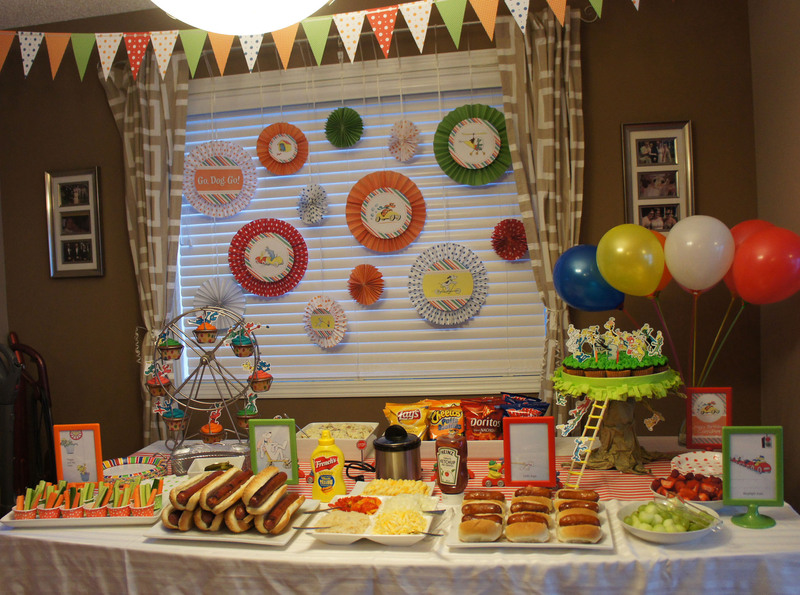 One of my biggest DIY projects for this party was the paper fans and pennant banners. 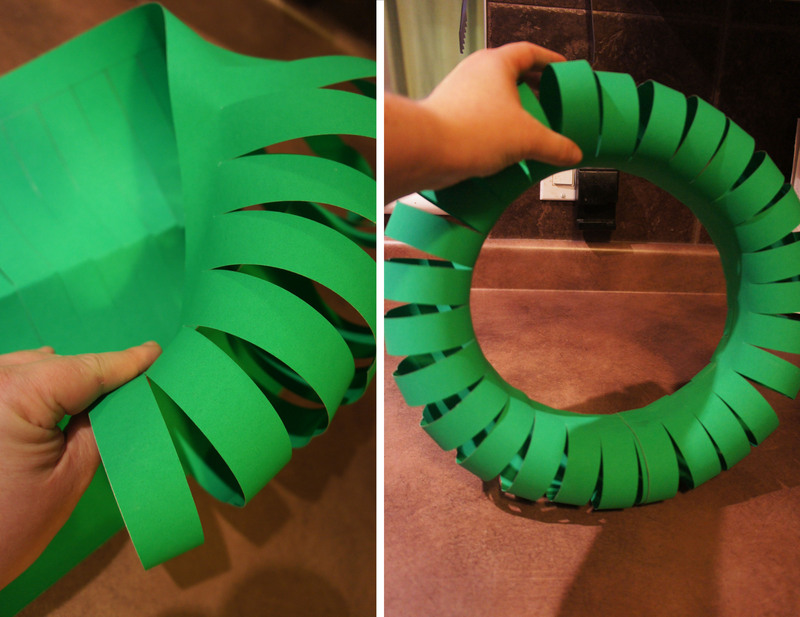 After searching online and not coming up with anything I really liked, I decided to make my own paper fans by folding and gluing scrapbook paper. I finished them off with printed images from the book and the scraps were cut down to make the pennant banners. I found small wooden cars on orientaltrading.com that were very close to the cars the dogs ride around in in the book. 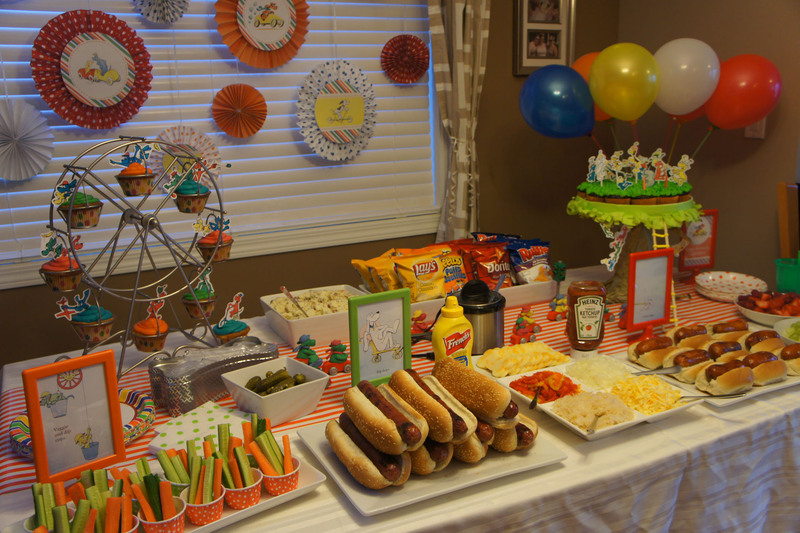 I sculpted individual dogs onto each of them and used them to decorate the food table. For the door wreath, I simply glued on more images from the book. I also had some blank canvases lying around so I decided to enlarge an image from the book and make it look like a giant book open on my fireplace. 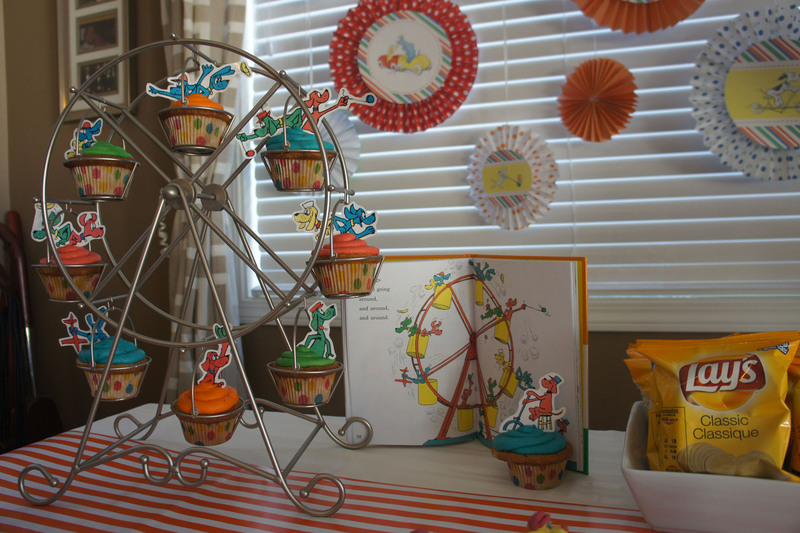 One of the first purchases I made for the party was my cupcake ferris wheel. I have always loved them and it was perfectly suited to one of the scenes in the book. To finish off the look, I scanned in photos of dog images from the book and printed and cut them out for cupcake toppers. I also baked a second batch of cupcakes and displayed them on a tree stand I constructed from a candle holder covered in tissue paper and one of my round platters. 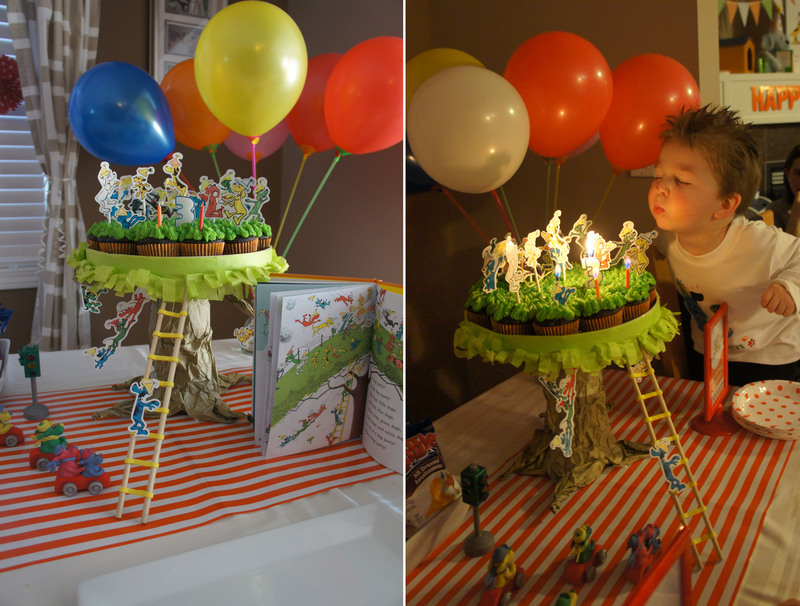 I made dog cupcakes toppers and a ladder to finish it off to look like the big dog party scene from the end of the book. 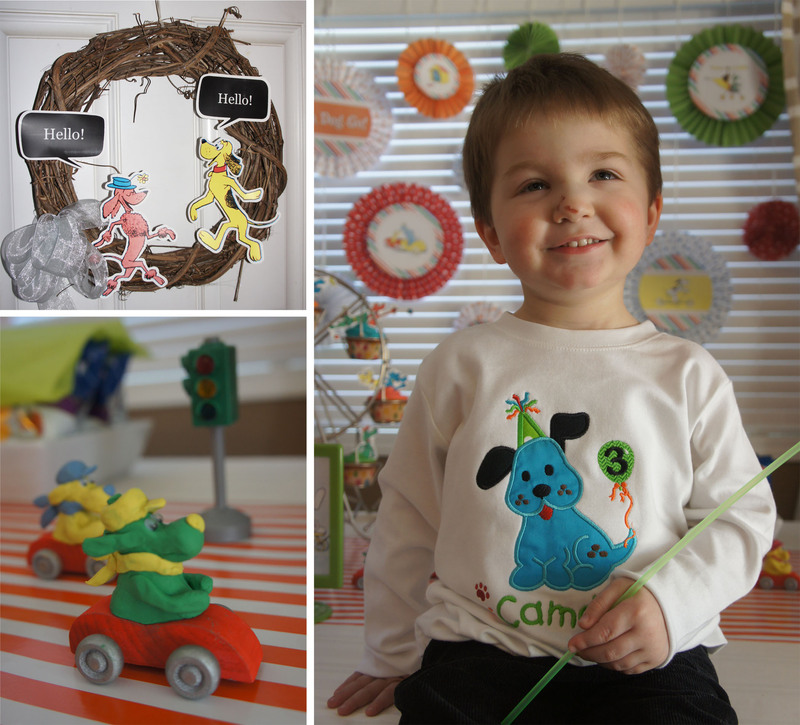 To print off your own cupcake toppers, my files are available here: Go Dog Go Cupcake Toppers Free Printable. I printed mine on photo paper, but cardstock would work as well. I then taped the cut-out images onto paper lollipop sticks to be inserted into the cupcakes. Cut down straws or coffee stir sticks would also be a good option. 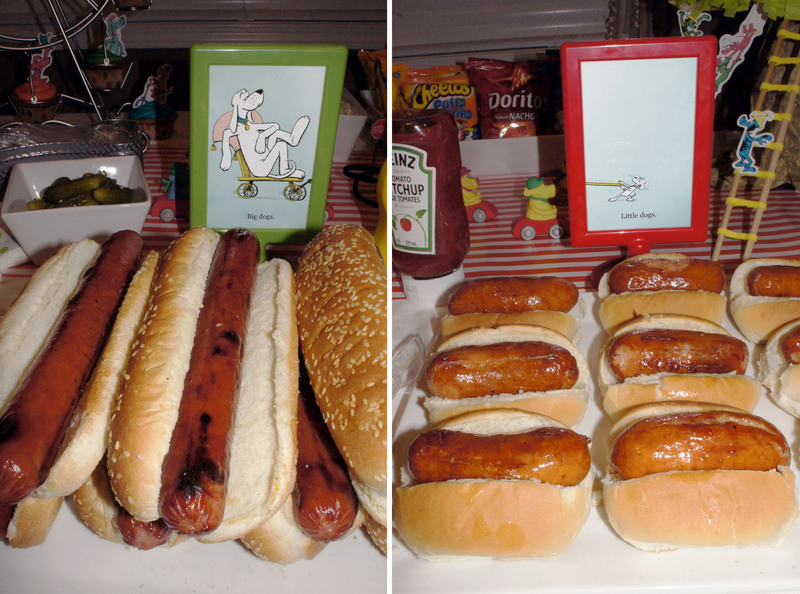 Big dogs and little dogs were served with all the fixings. 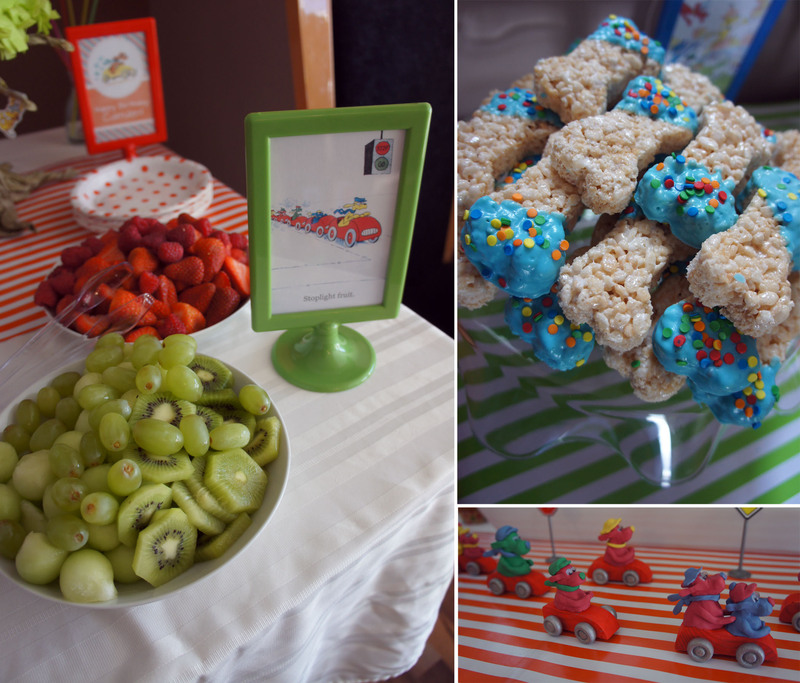 Sides included veggie and dip cups, chips, potato salad, stoplight fruit and chocolate coated rice krispie bones. 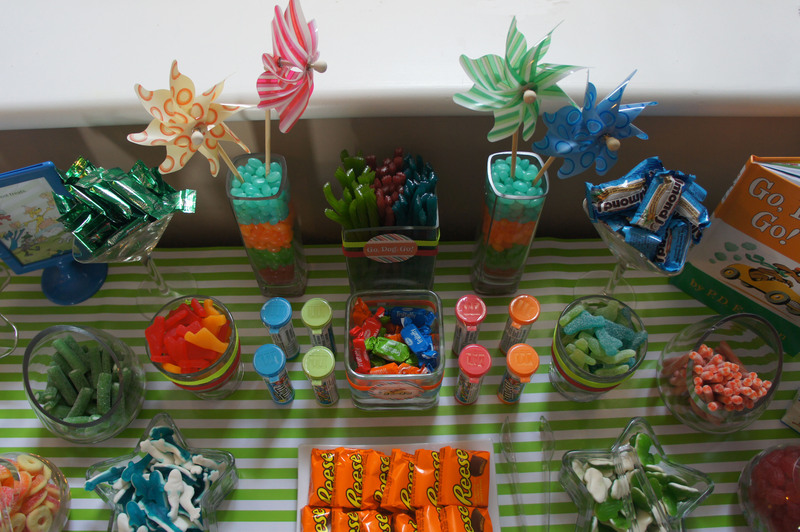 I decided to attempt a candy buffet with red, blue, orange and green candy to match my theme. I used a lot of glassware I already had around the house so it was fairly cheap and simple. I think the adults enjoyed the candy more then the kids! Favors were these cute dog shaped lunch boxes I found at Ikea and filled with a couple of cans of playdoh and a bone and dog shaped cookie cutter. I think that covers it all – thanks for looking! 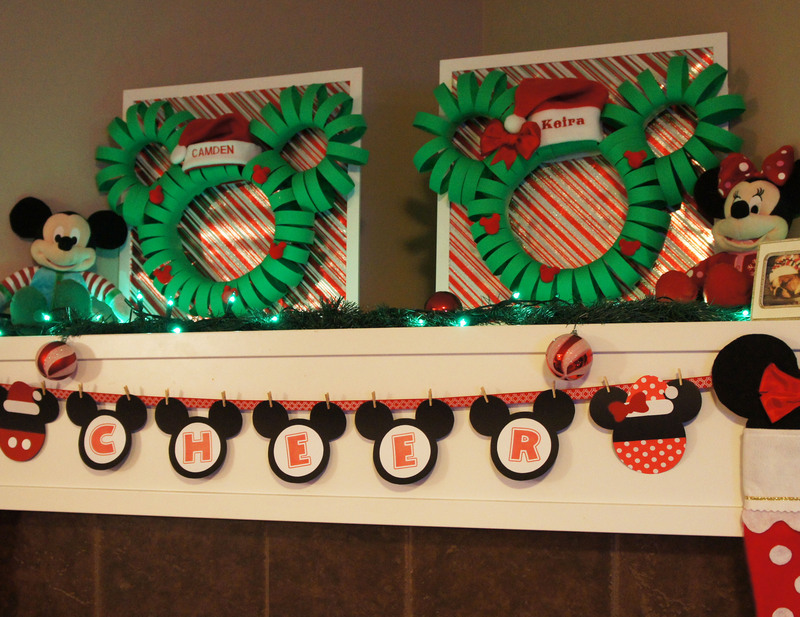 To see my party planning board on pinterest, please click here. I have already started pinning for next year’s party and I am hoping the birthday boy with be on board with the Winter Olympic theme I am planning.